Not an authentic image - but it gives you the idea. Mar: 4: This night I was invited by Mr. Rog: L’Estrange to heare the incomperable Lubicer on the Violin, his variety upon a few notes & plaine ground with that wonderfull dexterity, as was admirable, & though a very young man, yet so perfect & skillfull as there was nothing so crosse & perplext, which being by our Artists, brought to him, which he did not at first sight, with ravishing sweetenesse, & improvements, play off, to the astonishment of our best Masters: In Summ, he plaid on that single Instrument a full Consort, so as the rest, flung-downe their Instruments, as acknowledging a victory: As to my owne particular, I stand to this houre amaz’d that God should give so greate perfection to so young a person: There were at that time as excellent in that profession as any were thought in Europ: Paule Wheeler, Mr. Mell and others, ‘til this prodigie appeared & then they vanish’d; nor can I any longer question, the effects we read of in Davids harp, to charm maligne spirits, & what is said some particular notes produc’d in the Passions of Alexander & that King of Denmark. He continued to perform in Oxford at private houses and colleges for the next couple of years and left behind a corpus of musical compositions currently held in the Oxford Music School collection. Of particular interest to our project is Penelope Gouk's account which uses spatial metaphors and models to explore social and intellectual relationships in Oxford during the Interregnum (Gouk 1996). She refers specifically to the kind of musical gatherings which Baltzar, and presumably by extension his patron Sir Anthony, participated in and the ways in which both groups and locations intersected with the proto-scientific world of natural philosophy. Loads of names to get to grips with but hopefully what this will give us a start on is reconstructing something of the cultural milieu within which work on the gardens at Hanwell took place. 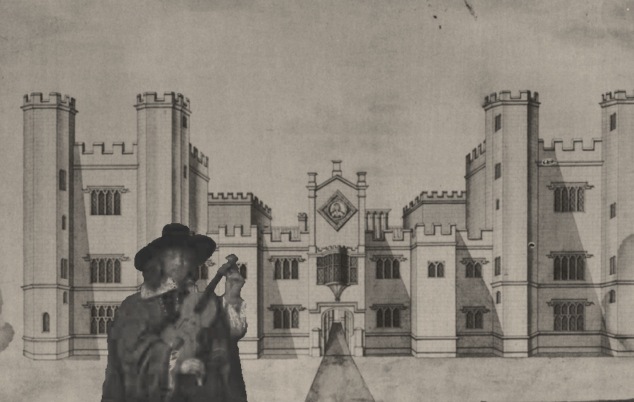 Following the Restoration Baltzar seems to have left Oxford for in 1661 he takes on a Royal appointment as a violinist in the Private Music at £110 a year. Sadly he didn't last long for in July 1663 he died, Wood giving the reasons as: 'the French pox and other distempers', or alternatively or perhaps simultaneously, delighting in drinking, made him drink more than ordinary which brought him to his grave'. Apart from giving us a soundtrack to the project and the opportunity for some summer music making the primary significance of Hanwell's live-in musician has to be both in what it tells us about life in the castle and its gardens during its heyday and the insight we get into the character and interests of one of its creators, Sir Anthony, the fourth baronet. The piece is a Sarabande in C major and the images are a variety of anonymous seventeenth-century violinists together with one or two other appropriate images. and was traditionally said to depict the Cabal Ministry of King Charles II Painted bySir John Baptist de Medina(1659-1710). 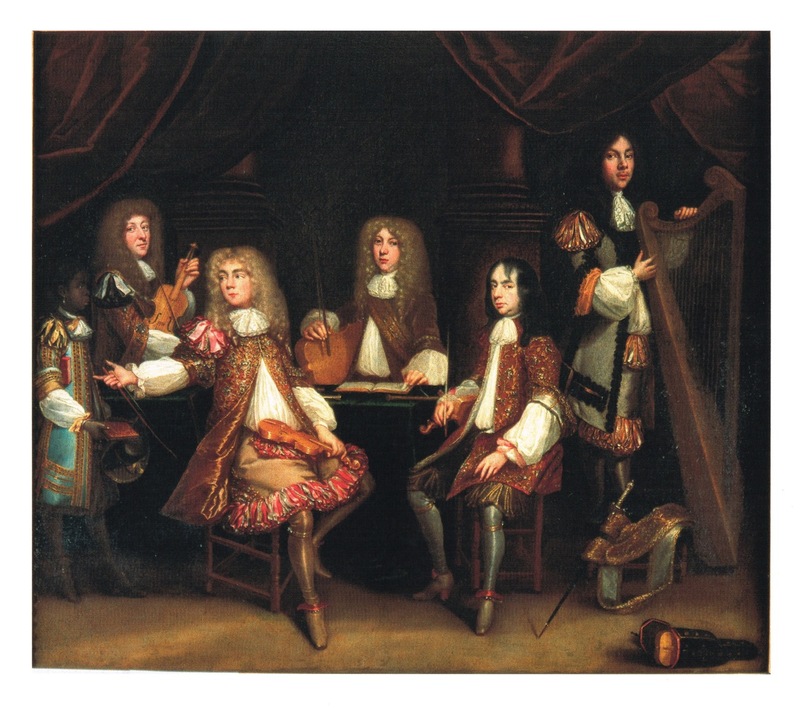 Holman makes a strong case that in fact this is a portayal of the King's musicians from the early 1660s in which case the seated figure to the left may be Baltzar.